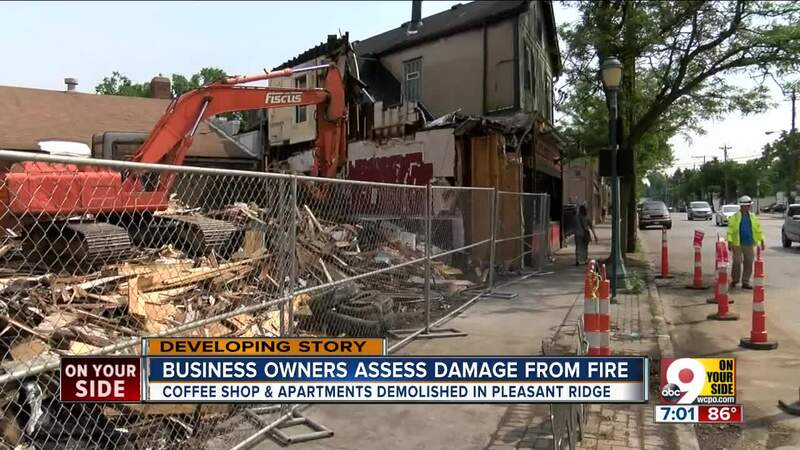 CINCINNATI -- Molly Malone's co-owner Josh Rhodes surveyed the damage from the Pleasant Ridge fire that damaged his business and destroyed another. “What a mess. Just kind of a nightmare,” Rhodes said Friday. 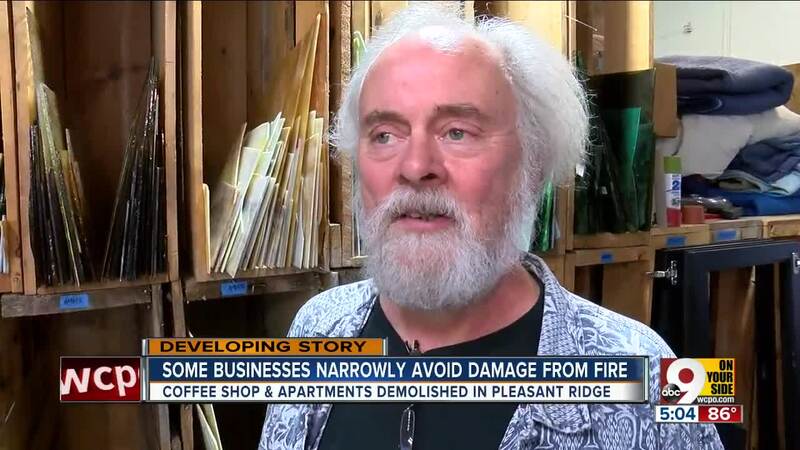 Thursday's fire caused $300,000 damage, and now the question is whether the restaurant and bar, a community cornerstone, or Coffee Exchange, which had to be torn down overnight because of structural damage, will reopen. Rhodes is going to wait and see. Rhodes stood in a hole in the wall where the entrance to a party room used to be. The fire and Coffee Exchange demolition destroyed the party room. There is heavy water and smoke damage throughout the restaurant and bar. The basement filled with water. “We are fully insured,” Rhodes said. “I know the Coffee Exchange was insured, but the two tenants upstairs, I don’t believe they have insurance. So they’re looking at a significant loss." Officials said the fire started in one of the second-floor apartments and spread to the Coffee Exchange on the first floor. Nobody was hurt, but Molly Malone’s is closed for now, idling 25 to 30 employees. Reopening depends on insurance adjusters and whether health department and building inspections determine the front of the building can be restored. Sarah Peters, owner of Coffee Exchange, didn’t want to go on camera, but she said she is thankful for the community support she has received. She said it's too early to tell what her future will be. Two other nearby businesses were spared any damage, and owners are thanking the Cincinnati Fire Department for containing the flames. Jeff Hoffman was sweeping debris from the Queen City Comic and Card Co. It’s right next to the space the Coffee Exchange occupied. "There’s a little damage to the outside of the roof — the eaves that hang over on that side of the building," said Hoffman, "but from everything we’ve seen inside - from the basement to the apartments upstairs -there’s no damage." Hoffman stayed inside as the fire burned just feet away. His entire livelihood consists of paper and books and easily burnable items. But not a single drop of water got into the building. "I did have a little bit of a smoke smell in here that came in through the part of the wall where the air conditioner is, but we never had any physical smoke," Hoffman said. "It wasn’t like it got smoky in here or anything like that." Nearby, workers patched the roof of Architectural Art Glass Studio, which is just 2 feet from the rear of Coffee Exchange. From inside, you could see the sky through a few damaged ceiling tiles. Owner Richard Duncan knows he was very lucky. "Actually, we had no fire damage," Duncan said. "We did have some water damage come through the roof. The firemen had to cut a hole in the roof to make sure we weren’t on fire." 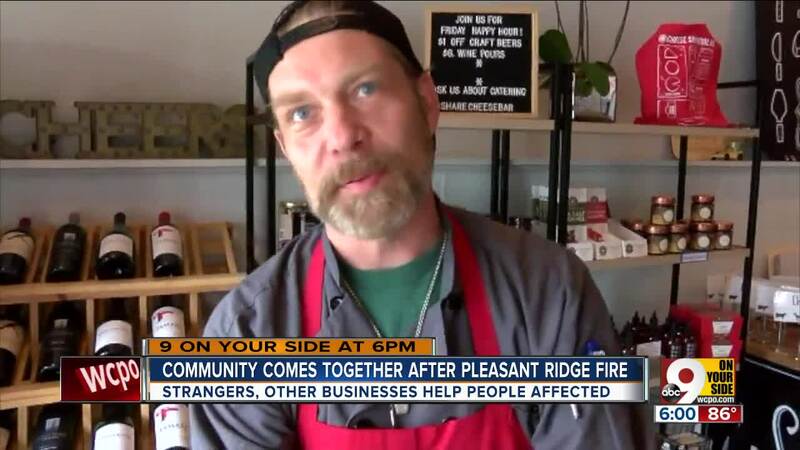 Business owners who weren't affected were quick to help others who needed it. With power out in the area, Revolution Rotisserie employees walked into Share:Cheesebar and offered to store food for them. "Revolution actually stored a bunch of product for the neighborhood," said Revolution chef James Owens. "Since our cooler was up and running, we were more than happy to keep their product fresh for them." "All the owners know each other, so it’s a no brainer to take it where they could fit it in — whoever had power," said Share:Cheesebar manager Kip Dully. The folks at Everybody’s Records, across the street from the fire scene, said that’s just the way Pleasant Ridge operates. "It’s like a family," said Harry Lushy. "The community is a family and everybody rallies to help everybody else." "I’ve been in this business 15 years and it’s awesome," Owens said. "It’s great that something so terrible can bring some neat things."